Congratulations to all the winners in the Needlework, Baking, Craft, Basket and Scrapbook contests. Thank you to all the people that entered this year. I was very pleased with the number of  entries in the baking and basket contests. As always, there was a great deal of imagination going on. The Needlework winners’ entries will be making their way to the BIG E for judging and hopefully will do well. 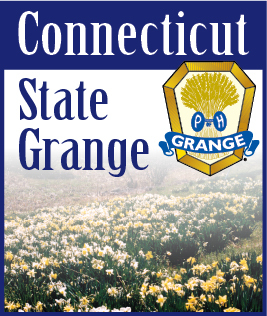 The winners of the state contests will be listed in the next issue of the Granger. Thank you also, for all the items for the Country Store at the BIG E.  They are very much appreciated and are going to a good cause. Also, a reminder to send in your donations to the CT Granger Trust Fund, the CT State Grange Scholarship Fund and the Foster Families “Kid’s Fund”.